Join or renew now and receive a 10% discount on your membership fee, and have your name entered to win an IABC Academy All-Access Pass! IABC membership provides the resources, connections to other communicators, and professional development opportunities you need to advance your career as a thought leader, and drive business results for your organization. Your IABC membership includes free professional development webinars, discounted IABC Academy courses, cutting-edge insights via IABC’s publications, connections with other members in The Hub, and participation at events like the IABC World Conference. What you need, and who you need to know, for the leader you want to be. 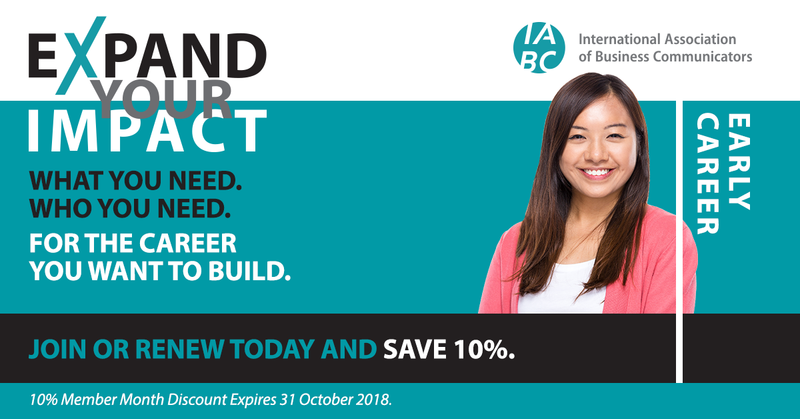 Join IABC/Renew Your Membership Today with your 10% discount for October Member Month! Copyright © IABC-NL | All rights reserved.